The scene is set for another modern Indian classic. It involves previous failures, deep systemic corruption, anti-terrorism, political ideology and ambition, at least two billionaires, a cast of 1.2 billion people, and a battleground for local and global outsourcing giants competing for the spoils of a multi-billion-dollar set of contracts and a truly life-changing three-year project that the eyes of the world will be watching and scrutinising for ideas and copycat re-enactment elsewhere, writes Robert Morgan, director of outsourcing consultancy Hamilton Bailey. Act One - the presidential palace in New Delhi 25 July 2009, the two billionaires meet. 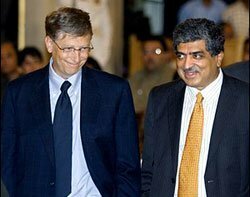 Bill Gates and former Infosys Technologies founder and co-chairman Nandan Nilekani against the background of the conferment ceremony of the Indira Gandhi Peace Prize. The talk is of Nandan's new role as government minister in charge of the Unique Identification Authority of India. The talk is of ID cards as critical to improving the delivery of social services, subsidies and other government programmes while also strengthening national security. Some1.2 billion people unified by biometrics and plastic. Corruption siphons as much as 80% of the funds meant for India's poor, according to studies from Harvard Business School and the World Bank. Gates' ambition was made clear with the words: "I'll certainly commit, Microsoft wants to be a partner.". "It's the mother of all IT projects," said Nandan. The gauntlet has been thrown down. Could this be the first real project where Microsoft's move into formal structured and head-on competition for the provision of outsourcing services is finally displayed? Closer to home, Infosys has not hidden its ambition, although Nandan will not participate in supplier selection. Tata Consultancy Services is also interested. In 2007, it issued ID cards to rural workers with short-term government contracts in Andhra Pradesh state. Wages of 2.5 million workers, previously outside the formal economy were deposited into Indian Post Office accounts. "This resulted in verification of identification and a clampdown on fund leakages," said S Ramadorai, CEO at TCS. Act Two - The pilot programme. Around 100 million identity cards are expected to be handed out as part of an extended pilot - almost twice the size of the UK's dying ID cards programme. India believes that it can roll out this IT project for 1.2 billion people for around £3bn, against the UK's £5.3bn - a bargain. Success however will be a true revolutionary leap forward for the world largest democracy. As George W. Bush said, "A billion people, in a functioning democracy. Ain't that something." If this programme actually delivers, then the world will have to agree "Ain't that something!!" and be very humble.